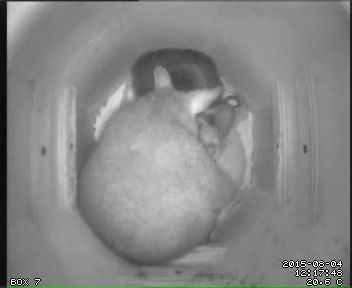 Possum TV: Baby Possum Time Again! Recently, Kiki has been visiting Box 7, and her latest baby (No. 13) has been seen out of the pouch for the first time. The baby was only out very briefly - it's still at the "starved frog" stage of development and probably get cold very quickly - and the screen shot above was the best I could capture. Now is the time to tune into Possum TV. Although possums are never completely predictable, going by past experience, Kiki will visit Box 7 a couple of times per week over the next two months, and we'll get to see more of the baby. Before long it will be climbing over her, using her as a trampoline and generally making a pest of itself. So be sure to check regularly; we only get to see this sort of thing at most twice a year, and I'd recommend selecting "Streaming Mode" if your browser supports it.